“Way up there?” I asked Silver Ballón, our guide, who was pointing up to the 13,000-foot summit. “Don’t worry. You don’t have to go all the way up. There are amazing views all along the way.” he replied. I immediately thought it was a trick. And it was, but the very best kind. Few places inspire hiking as the Sacred Valley of the Incas. 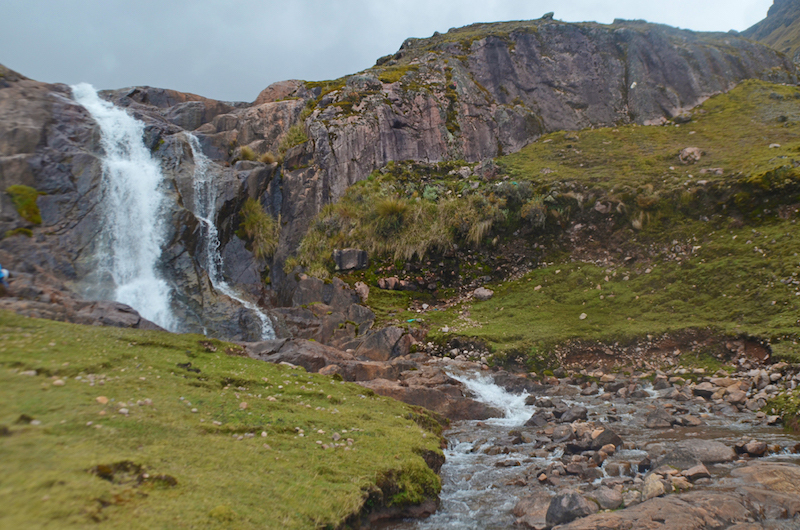 The most famous hike, the Inca Trail is a multi-day arduous trek, with each day ending at a campsite. But like most Baby Boomers, my backpacking and camping days were over, and gladly so. 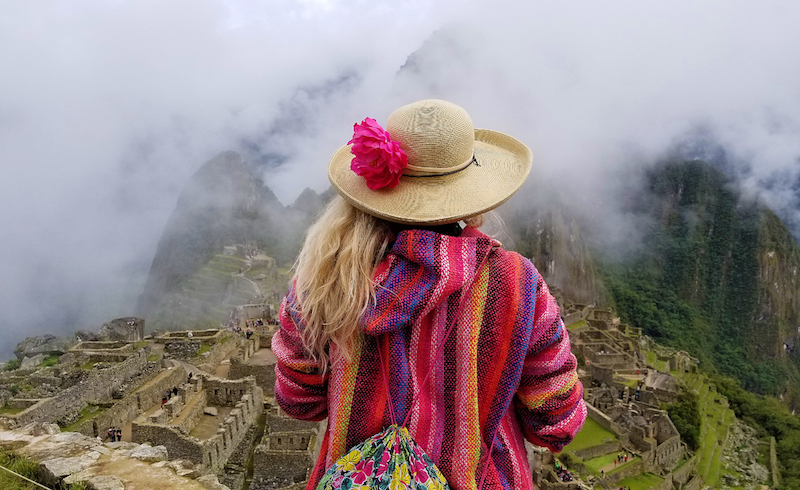 I chose the 7-day Sacred Valley and Lares Adventure to Machu Picchu with AdventureSmith Explorations, an eco-touring company that specializes in custom trips to Peru. 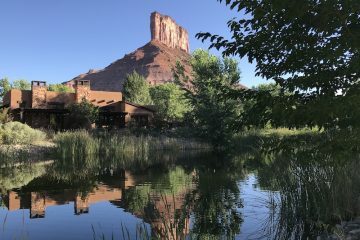 They offer custom hikes with a local guide during the day, and a luxury lodge at night. 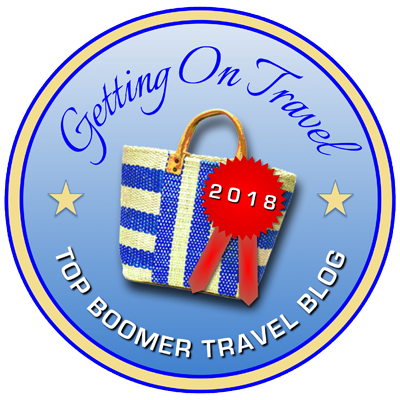 Right from the beginning, Silver demonstrated a keen assessment of our small group of Baby Boomer women – our desired itinerary and our level of fitness. 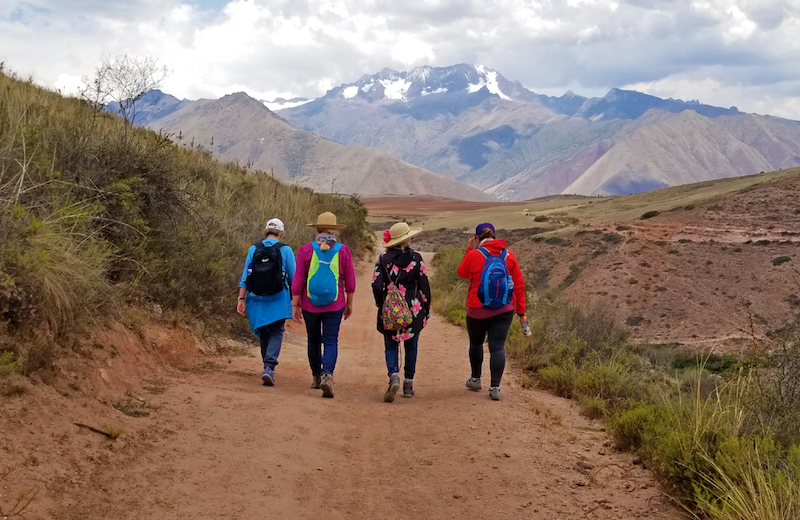 Along with visits to weaving villages, shopping in local markets, and eating pachamancha (meat and potatoes cooked underground with hot stones), Silver created a daily hiking experience that perfectly suited our abilities. Oh, and Silver’s trick? Knowing how much we love our Instagram photo ops, he’d hike us up challenging paths, and when we arrived at an intermediate viewpoint, he’d stop for us to rest and have water. Then he’d take our cameras and encourage horseplay… jumps, the shot from the back looking at the scenery, the pretend-you’re-walking shot, etc. 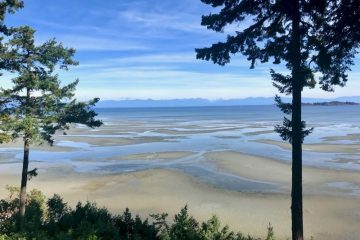 We would inevitably end up roaring with laughter, and the result was physical and emotional re-charging and the ability to continue. One of the highlights of Cusco Inca are the ruins of Sacsayhuamán. The altitude of 12,142 made the stronghold appear to be invincible, but Spanish conquistadors charged uphill and in an epic battle, defeated the Inca army. What an extraordinary feat that must have been! The steep climb in the high altitude was spotted with stopping points to catch my breath, but well-worth the vistas at the top. 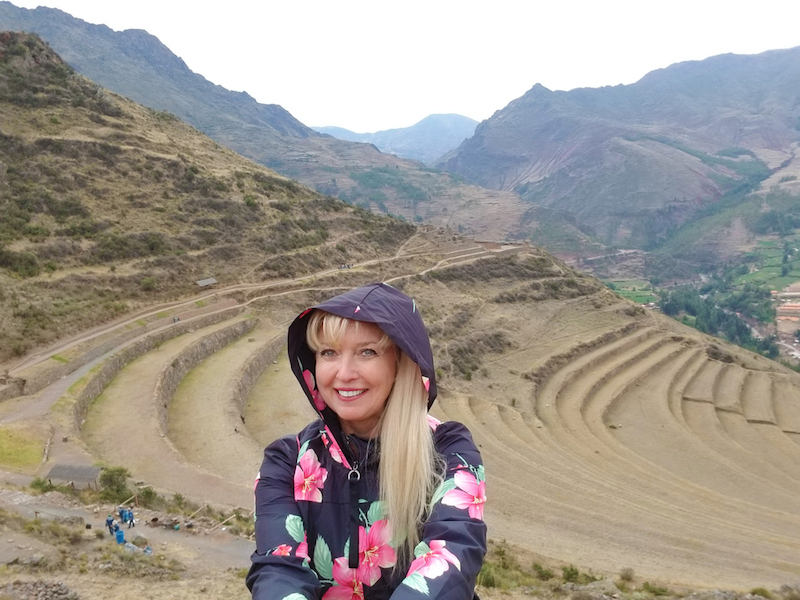 The ruins at Pisac are an array of terraces, remains of an ancient city, and jaw-dropping vistas. In a heavy mist, we trudged along a pressed dirt path with a rudimentary wooden protective rail. The views along the way were mesmerizing and the landscape eventually gave way to mammoth agricultural terraces gracing the side of the mountain. A rocky path led to the ruins of an Inca village of stone buildings and more impressive views. 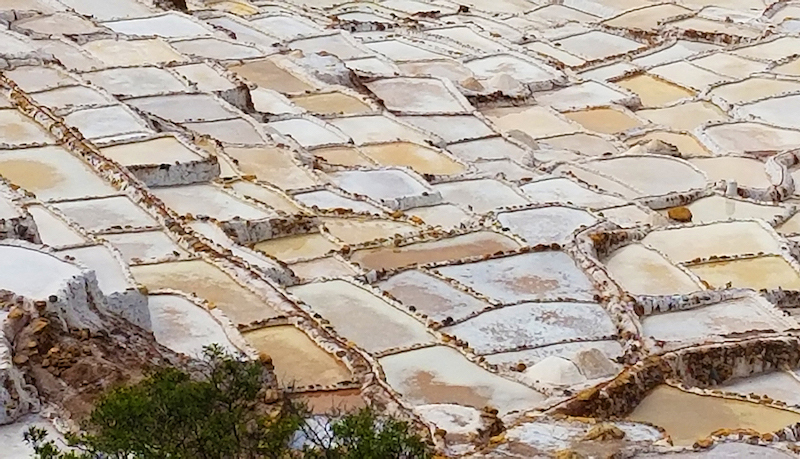 Getting to the salt mines was the easiest hike, all downhill starting from the colonial village of Chinchero. It was an enjoyable couple of hours with incredible views all along the way. The path led directly to the Maras salt mines, used since Incan times. Salty spring water is funneled into hand-built troughs, where the water evaporates, leaving 100% natural unrefined salt in its place. This was my favorite hike. There was not another soul in sight. Although the ruins themselves are not as impressive as some other sights, the panoramic views are unparalleled. Built into the mountainside are remains circular stone structures that the Incas used for storage houses. As you get closer to the top, the path is stepped and the incline increases until you feel the burn – in your thighs and in your lungs. Silver offered us some coca leaves to chew on, for “energy and altitude sickness.” I was the only taker, but they were so bitter I spit them out when he wasn’t looking. Close to the summit, the cliff drops were precarious – open and unprotected. “Just up at that next landing, the views are even better,” said Silver. Truth-be-told, he said that several times. He was right though. The 360° views were impressive. From our lodge perched atop a steep ledge, we hiked down into the village of Huacahuasi. We stopped to interact with the village children before continuing on an easy but scenic 2-hour hike to a set of waterfalls. I was ahead of the rest of the group, and as I rounded the dirt path, I was surprised to be joined by a heard of alpacas who were grazing directly next to the path. They were just as curious about me as I was about them! 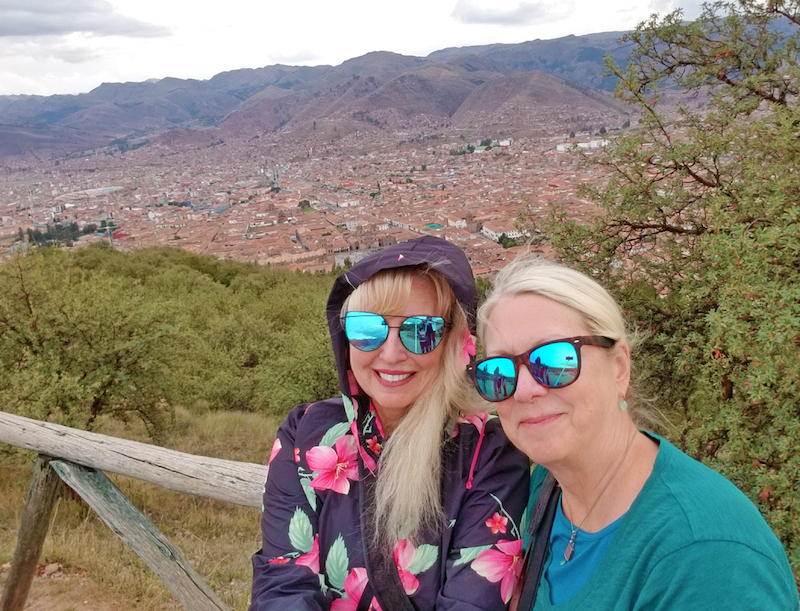 It came as a surprise when Silver announced one morning that we would have the opportunity to hike a portion of the Inca Trail. The morning mist soon turned into a bone-chilling rain, but I didn’t care. The scenic path swath through the towering mountains was stunning. 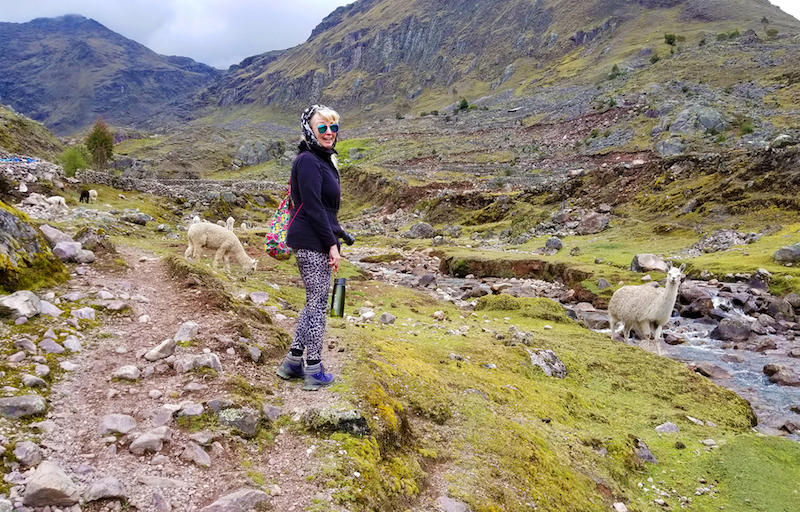 We walked on original Inca stone paths, crossed several creeks, past lush terraced hillsides, through heavenly-smelling eucalyptus forests, and stone bridges. The pre-Columbian town of Ollantaytambo is one of the best-preserved and most picturesque in Peru. 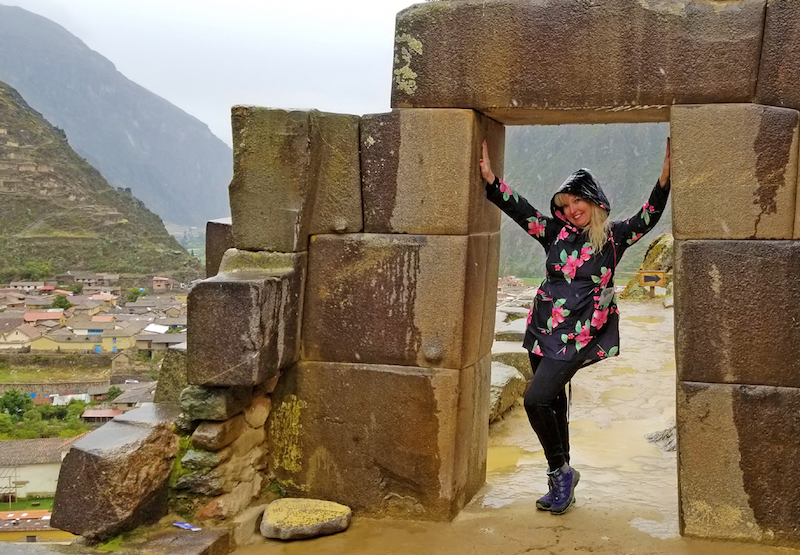 It’s a labyrinth of narrow cobblestone alleys, sitting in the shadow of the towering Inca fortress and agricultural terraces that wrap around the mountainside. The temple at the top was constructed from massive stones fit together without mortar. It was pouring down rain the morning of our hike up to the top of the ruins, so two of our group of four opted out. I told Silver I probably wouldn’t go all the way to the top, but just part way to get a closer look and see the views. Snuggled against the drops in my hooded raincoat, I climbed step after step, struggling to pull myself up the nearly vertical gigantic stone steps. The stones were slippery forcing me to focus solely on the path in front of me. “You made it – this is the top!” said Silver. I’m not sure how long they’d waited for me – I was distracted by the vista of the ancient Inca city below and Ollantaytambo village beyond that. Ah. Machu Picchu. It was on my bucket list before that term was even coined, and it did not disappoint. The first ten minutes are a killer – a nearly vertical climb to the money shot – that surreal vista in all the travel magazines. To say it was breathtakingly magnificent would be an understatement. Continuing, we got to the second spectacular viewpoint. Only this one had the added attraction of wild (but acclimated to humans) llamas. Just when I thought the photo ops couldn’t get any better! 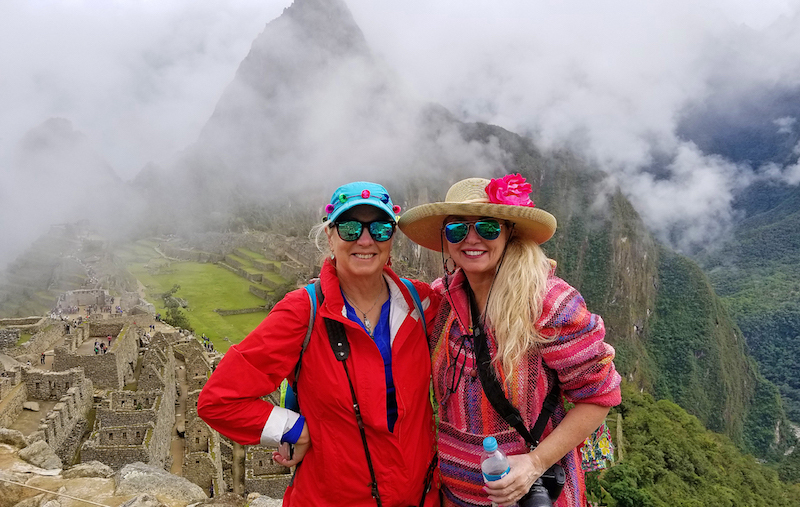 Boomers at Machu Picchu — what a thrill!. The hike through Machu Picchu takes around three hours, and with the new regulations, you must do it with a local guide. 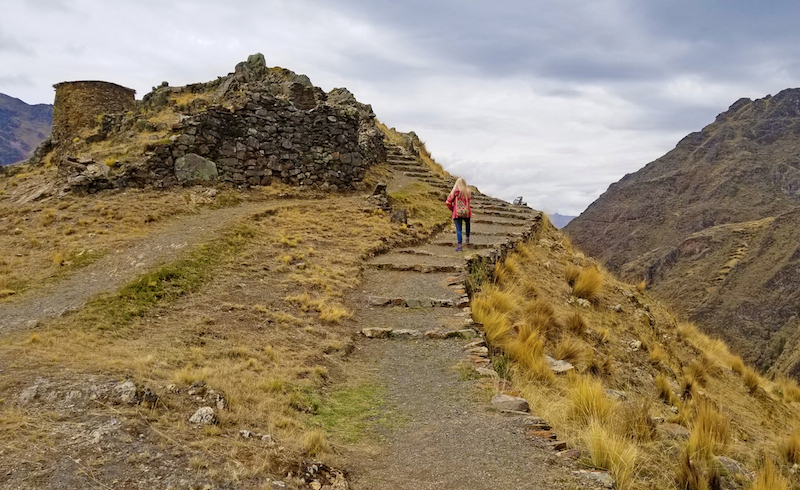 There is a portion of the Inca trail right inside the ruins, and a multitude of interesting spots in the lower section of the citadel. Visitors can also do separate hikes to the Sun Gate and Huayna Picchu – the mountain that towers over the citadel. 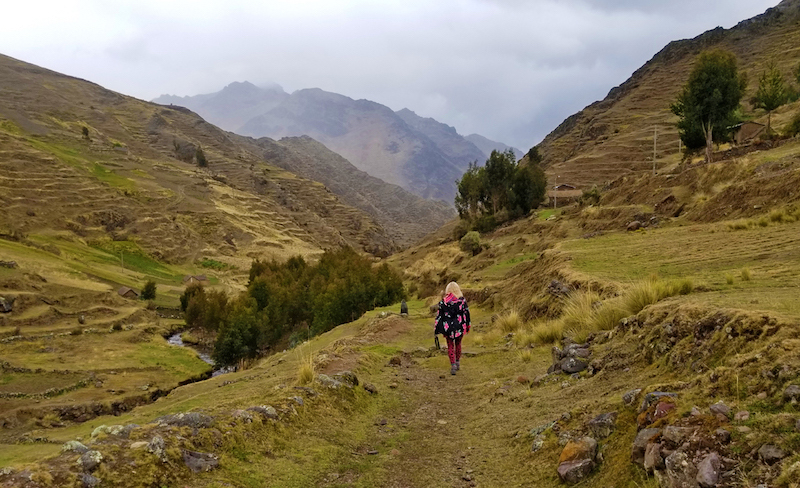 Unlike the famous Inca Trail that requires all-day extreme hikes and camping in the evening, AdventureSmith’s Lares Trek allows for custom hiking for all levels, with accommodations along the way in luxurious mountain lodges. Time saved by not hiking all day is used to absorb more of the cultural experience of Peru, e.g., observing ancient weaving techniques, partaking in meals with locals, bargaining in markets, etc. The altitude can be a challenge. Be sure to take frequent rest stops, drink enough water, and for some, even temporary altitude medication should be considered. 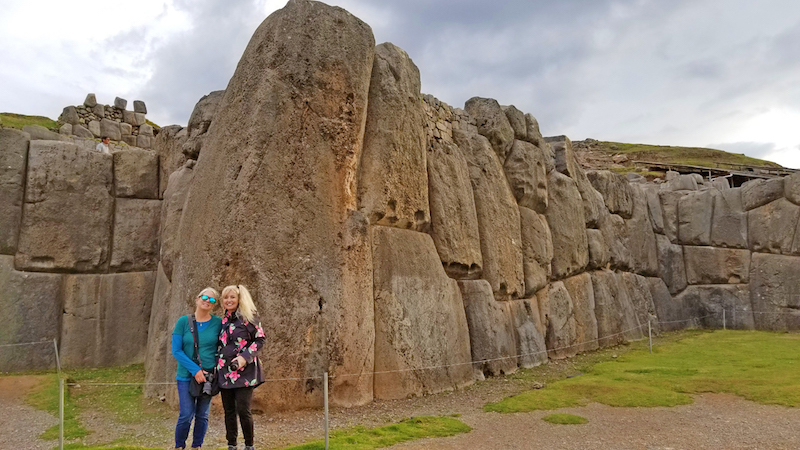 Disclosure: The author was a guest of AdventureSmith Explorations during her stay in Peru, but as always, the opinions, reviews and experiences are her own. 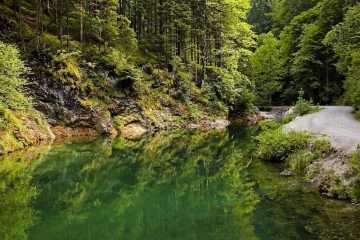 I really love itineraries that include excellent hikes. 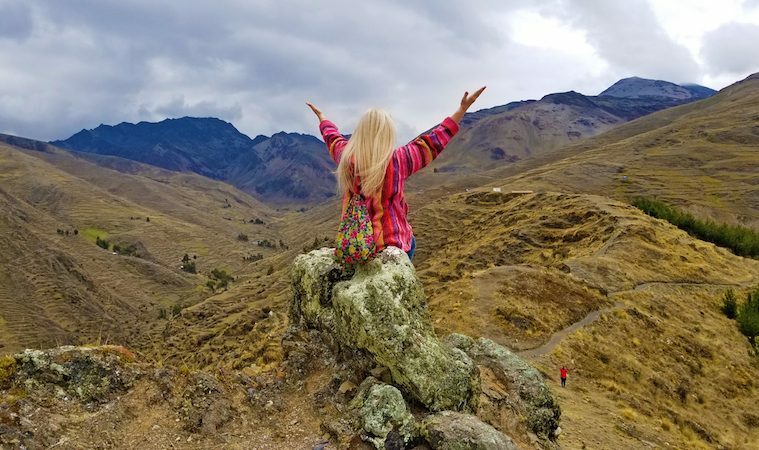 The Sacred Valley hikes look amazing — look at all that gorgeous scenery! AdventureSmith Explorations seems like a great go-to company for these hikes. I can’t say enough about AdventureSmith. 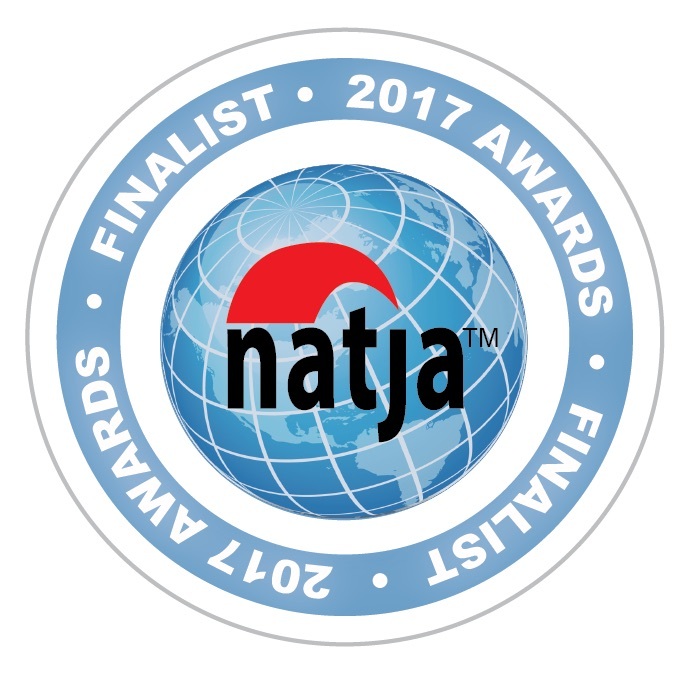 This was our second trip with them (first was Alaska) and we have been blown away by their knowledge, organization, and friendliness both times. What a great experience. So glad you were there and shared your photos. The Inca trail and Sacred Valley are powerful and beautiful. They are so memorable, Kristin! Definitely a trip I will never forget! 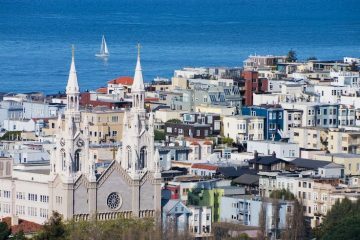 What a wonderful way to see this part of the world. 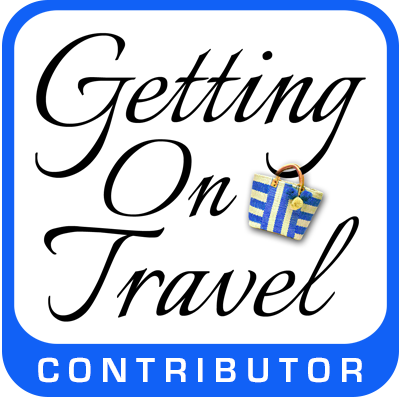 I loved our trip there, but you saw lots of more out-of-the way places than we did. This looks like so much fun. Great story and photos! So many people told us that, Cindy. AdventureSmith is so great in that way. We were able to do and see everything we had been wanting, and so much more! 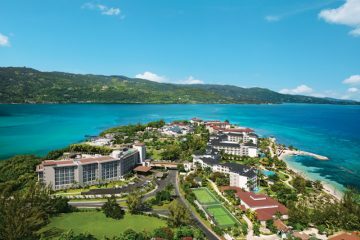 Such an amazing destination! And to share it with a close friend must have been over the top! My friend and I had had plans to visit Machu Picchu when we were in Peru. But there had been heavy rains in the mountains and they cancelled the train and we didn’t make it. Maybe next time! Oh, I do hope there’s a next time for you Doreen! Machu Picchu and the rest of the Sacred Valley are incredible! What a wonderful trip. I’d love to see this area. I like walking, but an not a seasoned hiker and don’t think I’m up for all day hiking so the more custom hiking levels of this tour appeal to me. However, I am not sure how well I’d handle the altitude. Donna — with a little preparation, I think you could do the hikes and even enjoy them! What a wonderful trip this looks like! I’ve heard so many great things about Peru…and love the idea of seeing so much on foot. 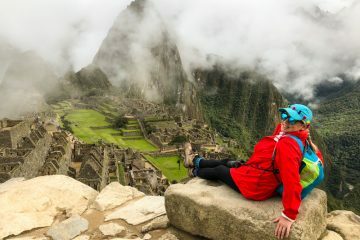 Peru had been on bucket list for soooo many years, and I can honestly say, it exceeded my expectations! I hope you get to go — do try AdventureSmith, you’ll love it! I could look through those photos everyday. What an incredible experience we had, although I think I feel heavy breathing coming on. Silver was an incredible guide, he made the trip so much more memorable! Lol, you’re too funny! I think we did an excellent job with the physical challenge under Silver’s excellent guidance. 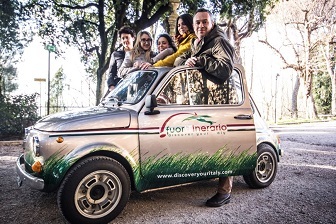 Your journey with AdventureSmith Explorations looks like a spectacular way to see these ancient wonders and breathtaking vistas! It sounds like it would be a good idea to get in shape for it in advance, even with taking breaks! Your photos are wonderful! It was one of my most favorite trips, even though it was also one of the most physically challenging! Dhara — I hope you get to go. It’s one of the most fascinating places in the world! Wonderful account and photographs. 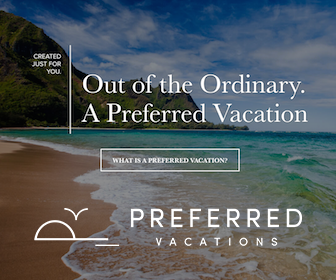 Machu Picchu is on my bucket list as well, and your account offers me a doable solution!